The Cimarron Loop is located in the Dennis Weaver Memorial Park near Ridgway, Colorado. The trail begins at the end of the Stagecoach trail about a quarter mile from the parking area. From there it makes a loop along the flanks of Boot Hill out to the parks boundary and back. Enroute it is connected to by the San Juan Loop and the Eagle Alley trail. From the end of the Stagecoach trail the Cimarron trail begins straight ahead. Almost immediately the San Juan Loop trail branches off on the right. In less than 200 feet the trail splits and the loop begins. For this post we followed the right fork and went around the loop in the counterclockwise direction. The right fork is the lower side of the loop. A little more than 100 yards from where the Cimarron Loop begins it passes the point where the Eagle Alley trail branches off on the right. Looking up the side of the hill a bit the return side of the Cimarron Loop can be seen. The trail continues northward along a bench that overlooks the Uncompahgre River traveling through short sagebrush and tall grass. As the trial approaches the parks northern boundary it begins looping back in the other direction. The trail remains relatively easy as it heads south with new scenic views to enjoy. The upper portion of the trail is a little rockier but the route is well laid out for an easy time of it. 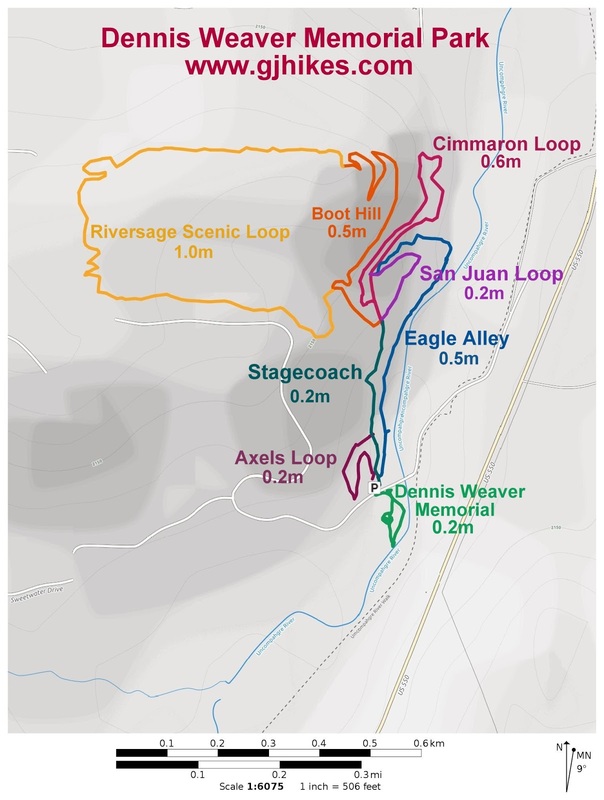 In this picture you can clearly see the courses of the upper and lower trails. The loop comes to an end as the two trails reconverge. From here it is a short distance back to the top of the Stagecoach trail and the San Juan Loop or you can go to the left again and pick up Eagle Alley which runs back to the trailhead. 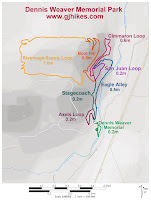 All of these short trails taken together offer a lot of great routes for trail running as well as hiking and biking. The Cimarron Loop is a good variation that is thrown into the mix. If you would like to see it for yourself then all you have to do is grab your bike or 'Take a hike'.